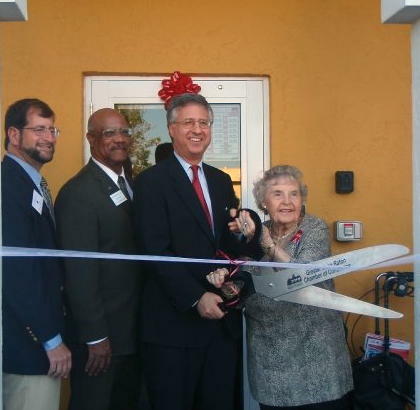 Michael Lampert, chairman of the Greater Palm Beach Area Chapter of the Red Cross; Boynton Beach Vice Mayor Woodrow Hay; Palm Beach County Commissioner Steven Abrams; and Countess Henrietta de Hoernle. 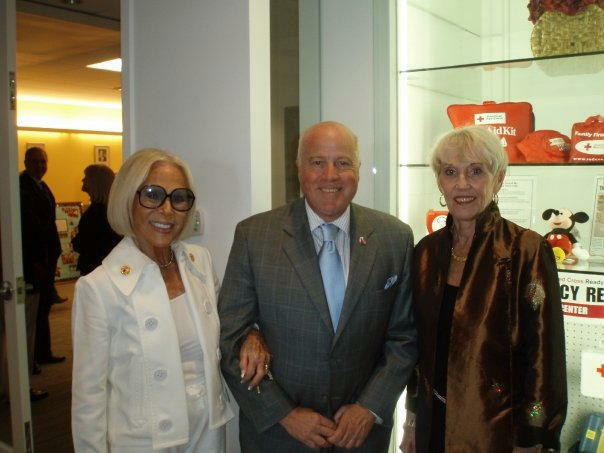 BOCA RATON — More than 150 business and community leaders and supporters of the Greater Palm Beach Area Chapter of the Red Cross gathered April 23 to celebrate the re-opening of the South County Service Center in Boca Raton. Countess Henrietta de Hoernle cut the ceremonial ribbon for the newly renovated 7,482-square-foot building that bears her family’s name. The event spurred several guests to become volunteers and helped raise more than $12,000 to benefit the array of services offered at the facility, including disaster prevention, preparation and response. Boca Raton-based NCCI Holdings Inc., headquartered in Boca Raton, made a $5,000 donation to the Red Cross at the event. The Count & Countess de Hoernle Service Center, located at 5820 N. Federal Highway in Boca Raton, first opened in 1970 to serve the communities in southern Palm Beach County and was originally staffed solely by volunteers. Now operated by a team of four staff members and approximately 200 volunteers, the facility provides programs and services to residents living south of Hypoluxo Road, including Boca Raton, Boynton Beach and Delray Beach. To address the growing needs of the more than 250,000 residents of the tri-city area, the Red Cross made $1.8 million worth of renovations were made to the building to increase training room capacity, office storage and supply areas. The renovated cener, constructed by Valcom Design & Construction, now will serve as a back-up location for the Red Cross Chapter’s disaster operations center. For more information on the South County Service Center, call 561.994.2060 or visit www.redcross-pbc.org/southcounty.